When we're at our beach house in Bay Head, New Jersey, and the girls can't talk me or Rex into driving them to Hoffman's in Point Pleasant Beach NJ for a thick shake float, we all have the good fortune of having a fridge full of Grab-N-Go flava from Cold Stone Creamery on Cedar Bridge Avenue in Brick, NJ. Just like our Roxiticus Desperate Refrigerator, our Bay Head Beach House fridge is stocked with at least ten different seasonal micro-brews and the freezer always has at least two quarts of Cold Stone....while we stock Rocky Off Road and Founder's Favorite in our freezer up north, at the beach we favor Shock-A-Cone and Cake Batter Batter Batter. Over Memorial Day Weekend, when Rex cooked steaks and we brought them across the street to Jango's house to serve dinner for eleven grown-ups and four kids, our two girls ran back across the street with Jango's 10-year-old daughter and her friend to bring three Grab-N-Go quarts back for the convivial crowd of 15 to share for dessert. 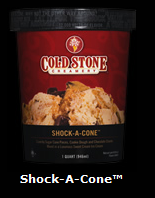 Starting right now through the end of the year, there's an Awesome Cold Stone Contest going on. If you have or know some kids between the ages of 13 and 19 and think you've got what it takes to create your own Cold Stone Signature Creation and get your friends to buy it, this is your chance to put your skills to the test in Cold Stone Creamery's iMix America contest. The rules are pretty straightforward, but check the web site for fine print. Come up with your own Ice Cream Creation using ingredients you can find at any Cold Stone Creamery location. Give it a cool and clever name, say Bay Head Bananaloha! Then get your family, friends, and fellow bloggers to try it and vote for it online. Creations with the most votes move on to the next round(s), where voting continues until December 31, 2008. The winner will be announced in January 2009 and gets a cool, sweet thirty grand ($30,000). So I'll make you a deal...give me your kids and I'll give you my secret concoction....post a comment here on the Bay Head Blog if you have a teenager between ages 13 and 19, and Roxy will be in touch. We'll enter the contest, promote our Creation right here and over on my Roxiticus Desperate Housewives blog, and when we win, we'll split the cash. But hurry...as soon as I get back down to our beach house in Bay Head, I'm going straight next door to Edie Britt's house -- her son is 14 and her daughter will turn 13 over the summer -- to sign them up for the Awesome Cold Stone Contest before Jango across the street gets to them.